Innovative, versatile casual technical fleece engineered for riding. 3L construction with a windbreaker membrane laminated between two fabric layers. 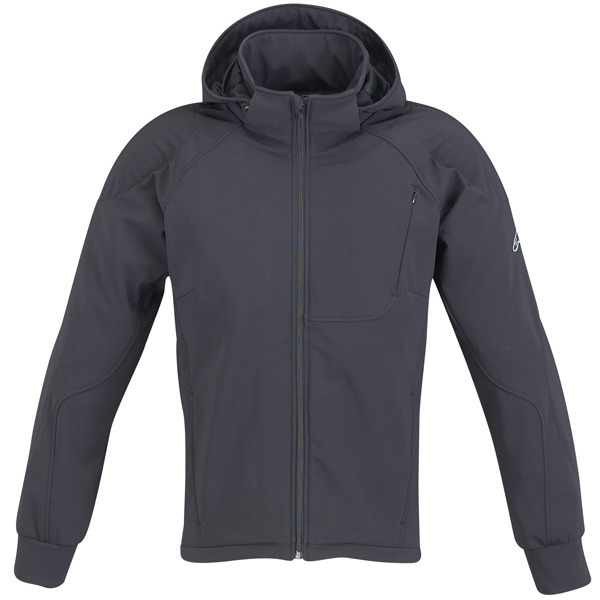 Soft outer shell allows freedom of movement, windbreaker membrane provides wind resistance and fleece lining gives comfortable thermal insulation. Removable hood with shock cord adjusters; cords have a hook-and-loop trim tab and a functional garage to affix the cords inside the collar. Fixed fleece liner. Elbows and shoulders have PE foam inserts that can be upgraded to Alpinestars Bio-Armor inserts. High-profile collar. Three external pockets. Longer rear profile. Shock cord waist adjustment. Bike key holder installed in right pocket. Front center reversed zipper. External chest pocket features a micro zipper to hide the pocket and maintain a clean look. City Collection exclusive trimming and labeling.